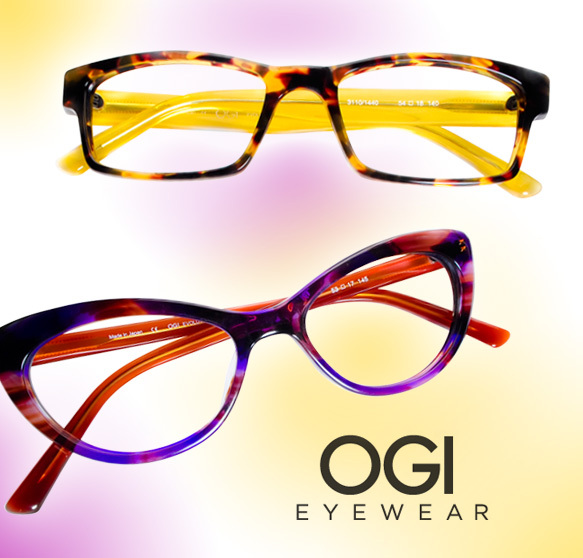 With vibrant hues and chic shapes, Ogi Eyewear is making an eye-popping statement this season through its fall collection, which features two stunning sets of specs. The 3310 style’s sunflower yellow inner temples, and brown, amber and golden speckled rims, create a color palette that is sure to brighten up any face. And these large, rectangular frames give peepers an added dose of hipster cool. Crafted to be versatile, these glasses can be worn by just about anyone who’s looking to amp up their look in a classy way. Interested in other colors? Well you’re in luck because this style comes in various patterns and shades. Those who dare to be bold and blast into the past should decorate their eyes with the 3114 style, featuring a fun, cat-eye frame with streaks of rich colors. Adorning your face with the beautiful pattern—featuring opulent purple, deep blue and warm red tones—will cause everyone to stop in their tracks when they catch a glimpse of you in these specs. Enjoy looking fabulous in either, or both, of these glasses! They’re perfect additions to any fall-centric wardrobe. Check out these frames and more at OgiEyewear.com.